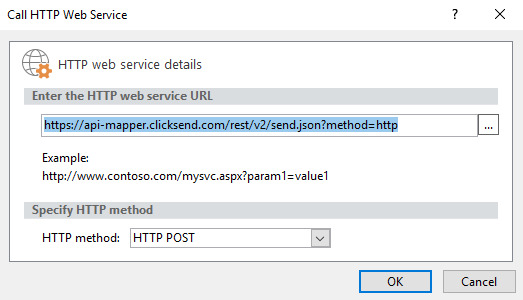 https://api-mapper.clicksend.com/rest/v2/send.json?method=http&to=61411111111&message=Hello NOTE: This method is less preferable as it requires URL-encoded phone number and message. This URI that works for testing from the browser: (This works but exposes the password). 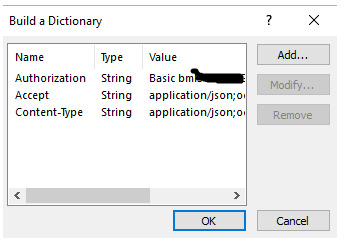 (replace aaaa and bbbb with your username and API key). The workflow will end up looking like this and will be explained further below. 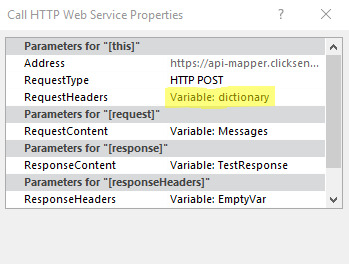 Call an http web service using the variable "Messages" containing TO and MESSAGE that you just built. As indicated by the red dots you can create a new variable for each response item to use for logging or control. 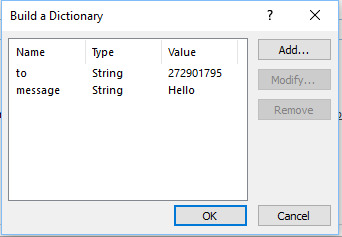 Highlight the http call and use the dropdown arrow to find properties and set.